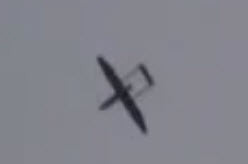 HomeDronesVideo exposes Venezuela's made-in-Iran drone. Chavez: "we are making drones, assembling rifles". During his speech on Jun. 13, at the Ministry of Defense, President Hugo Chavez reiterated Venezuela’s sovereign decision to consolidate its independence from foreign threats through initiatives such as the military buildup and development in the defense field. During the event, he presented some Iranian Mohajer 2 drones, operating in Venezuela under the name of Sant Arpia. The following video is one of the few available on the Internet showing the drone being built by the Cavim (Compañía Anónima Venezolana de Industrias Militares at the Maracay factory. Interestingly, on the same site, Cavim has built an AK-103 rifles and ammunition factory that, with the Russian support, will have the capacity to produce annually 25,000 rifles and 60 million cartridges. So far, it has produced 3,000 units.